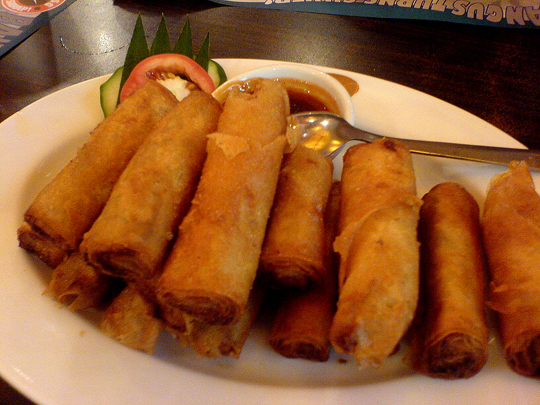 Lumpiang bangus is another delicious variant of the famous lumpia recipe. I already covered the lumpiang shanghai and lumpiang sariwa recipe few months ago. As we already know, the typical lumpia consists mainly of pork and chopped vegetables. This one, its all about the fish. 1). Clean bangus (milkfish) by removing the scales, removing gills, internal organs and washing the inside part of it. 2). Slice the backside to expose meat. Pour soy sauce and squeeze the lemon over. Parboil just until pink is gone. 3). Cool. Remove bones. Set aside. 4). In a skillet, saute garlic and onion in olive oil. Add the fish meat, and all ingredients. Add salt and pepper to taste.Cook 5 minutes. Cool. 5). Wrap 1 tbsp of the mixture in lumpia wrapper. Continue until wrappers or filling is used up. 6). Fry in hot oil just until light brown. Serve hot with sweet chili sauce or any dip sauce you want. Enjoy. instead of bangus,can u used tilapia as well?does it makes any difference?hirap kc pagtanggal ng tinik sa bangus? I think this is a variation of the relyenong bangus. What a cool idea instead of putting them back inside the fish sac, use lumpia wrapper. I will definitely do this one. Wow, this is the first time I have heard of this recipe. Looks delicious. I dearly remember college when I would make tuna spring rolls for friends. Bangus may be different in a way that you have to remove the fish bones which are troublesome. if there is one thing i hate about bangus… it's their bones… but making them to these lumpia, sure is a convenient and just enjoy eating. Yahweh bless. Oh my I'm a big fan of the pork stuffed version of spring rolls. Lumpiang Shanghai FTW! I haven't tried a fish stuffed lumpia, the fish is deboned?